As I reflect on the past year as President, I’d like to thank the IBAH Board for everything! Our board, members, associates and partners have made it a fantastic year and I look forward to a successful 2018! Our monthly lunches brought with them speakers from the IBAO, Intact and Travelers. Always very informative. We continue to promote our events and information through our website, Linkedin and Twitter. New to our social media family is Facebook, where you will see photos of our events and up to date goings on of our events. If you have yet to get on our email list, please visit our website www.ibah.org to sign up as we send out bi-monthly updates of our events to keep you in the know. Or, please follow us on twitter Continued our offering of pertinent educational seminars providing knowledge on today’s events and tomorrows problems. In April we hosted our Meet the Underwriter night. This is always a highly anticipated event with an overwhelming turnout by our Broker Partners and Brokers. This was our second year hosting this event which proved to be very successful. Next Meet the Underwriter event will be held in April 2019. Completed three Basic Broker Licencing Courses facilitated by Julie Ryan. We continue to be one of the leading Basic Broker Preparation programs in Ontario. This year we will again have three more offerings. Lynn Uildersma, our vice president, organized and hosted our annual golf tournament at Willow Valley, which was also a huge success, and well received by all. Once again our annual Christmas Mix and Mingle was very well attended. Always a great time getting to know our members and colleagues. We continued with our “Bip the Town Magenta” campaign this year. Always such a good feeling to team up with our fellow brokers to donate within the community. We continued promotion of the Bipper throughout our community with sponsorships of the following; the City Kidz Gala, Hamilton Mountain Cobra’s youth baseball team, Crime Stopper’s, Rygiel Homes and Neighbour to Neigbour. In February, Ryan Becker, our Public Relations chair, organized our first annual Family Fun Bowling Extravaganza which was offered exclusively to our broker members. A morning of bowling and pizza in exchange for non-perishable foods, which were donated to the Neighbour to Neighbour organization, along with the IBAO bipper blankets and funds raised from the 50/50 draw. Our annual BBQ organized by Milena Lewandowski, program chair, was once again a big hit. The Beach theme went hand in hand with the beautiful and sunny day. Although water levels prevented us from having lunch outside, we were still able to enjoy a few beverages on the patio while perusing the trade show. What better way to end the week socializing with your colleagues down at the Bayfront in Hamilton. There are currently a number of positions available on the board. If you or anyone you know is interested in being part of the board, please contact me or any of our board members. It truly is a volunteer position that is rewarding. As well, if you have any ideas you would like to bring forth for events, fundraising ideas or educational seminars, we would love your feedback. Alternatively we would love to hear constructive feedback on how we can improve. We can’t fix it if we don’t know it’s broken. Again, I would like to thank the board, our members and affiliate members for making this a truly rewarding experience. 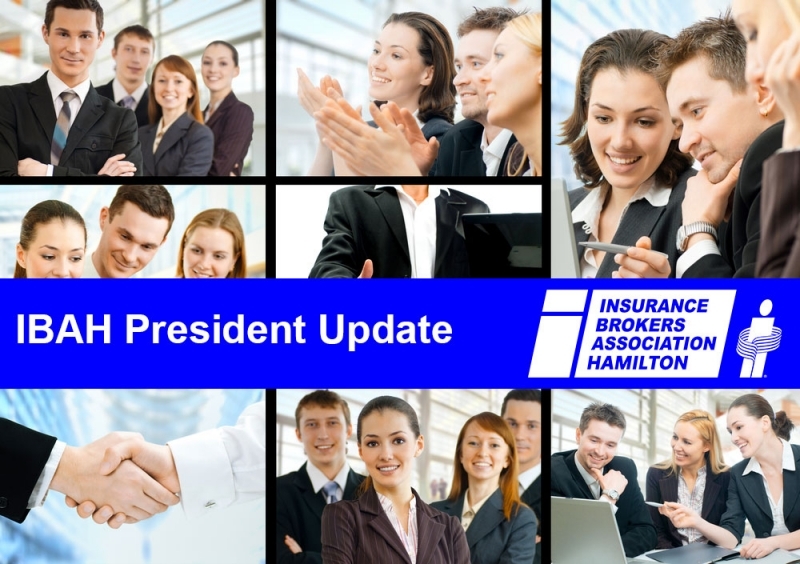 I look forward to another year as President of the Insurance Brokers Association of Hamilton. This article was written by IBAH Board President, Ashley Manti.